The early results from the Australian 2011 census have appeared. There has been a lot of comment on the trends for religion. 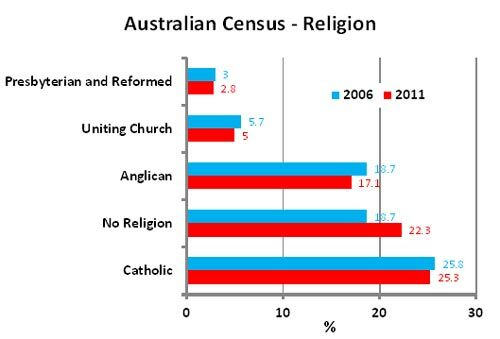 The No Religion group has now moved to second place (22.3%), behind Catholic (25.3%) and ahead of Anglican (17.1%). And, the No Religion group is the only one of the major religious groups that has increased since the previous Census (2006) – all the other major religious groups have declined. I have summarised the data (from 2011 Census QuickStats: Australia) in the figure below. This trend is just a continuation of that clear since earlier census results (see Secular twins and Non religious in Australia and New Zealand). And Australia still has some catching up to do with New Zealand. (In 2006 the No Religion was about 34% in New Zealand and 19% in Australia). Although this might be at least partly due to the fact that in New Zealand we put the “No religion” choice at the top of the box while the Australians put theirs at the bottom (see Non religious in Australia and New Zealand). I’ll return to this when the Australian detailed census data is published. My interest is to see the breakdown with respect to age. Previous results in Australia and New Zealand show that the “No Religion” choice is much higher for younger people (see Religious belief and age). And the recent Pew data for the USA show there was a sharp jump in non-belief among younger people in the middle of the last decade (see Sharp increase in “nones”).